By the time you read this, some of you may have already started your pre-season rolling. I have completed four passes to date, but many may not have even started as we are experiencing a very slow transfer from winter into spring. 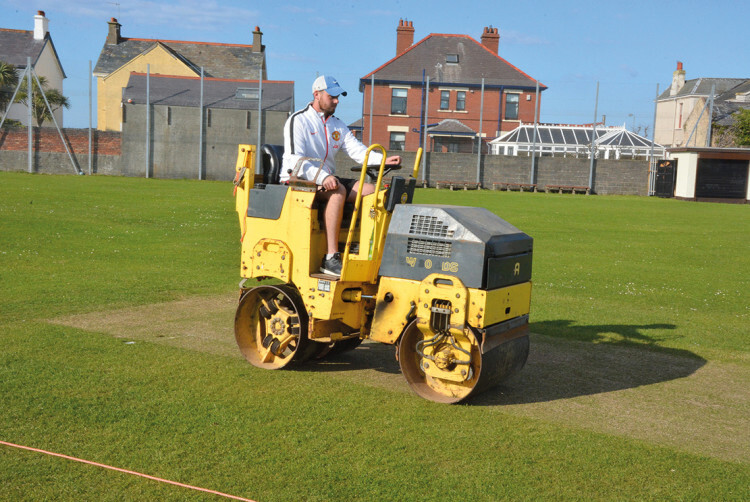 Gordon Gill gives us an insight into why it's important to carry out pre-season rolling. During the winter months, the soil soaks up the rain and fills the pore spaces within the profile. As this happens, the clay soil swells. As grass growth picks up, the roots start to pull the moisture out of the profile. The days get longer, increasing soil and air temperatures and, driven by warmer sunshine, this help to dry the surface of the profile and also pulls the moisture out; thus shrinking the clay profile and leaves empty spaces - like an Aero bar of chocolate. These spaces need to be closed down to achieve the solid block that we need to create the consistent pace and bounce that we all desire to play our cricket on. Again, the science report on rolling explains that we need to start with a lightweight roller and, during the programme, increase that weight quite quickly. I mow my square all winter using a 30 inch Hayter Senator which must be twenty-five plus years old, but I love it. This is quite a heavy machine, so I only consider this when my light rolling is done; just as soon as the ground conditions appear to be right. 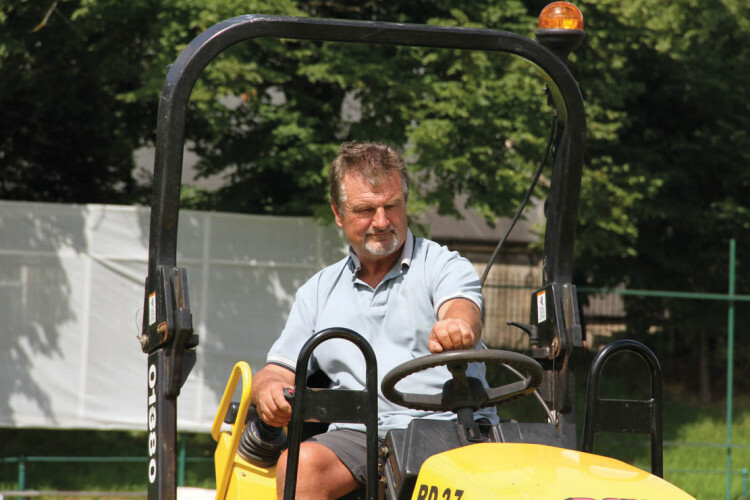 If, when rolling, the roller is getting wet, then I get off the square. If the roller shows the odd damp patch, then I consider that to be fine. Remember, you will need a small amount of moisture in the profile to act as an adhesive to actually stick those pore spaces together. Now, how fast do we go? You aim to travel at half a mile an hour; this equates to taking approximately one and three quarter minutes to get from one end of the pitch (wicket end) to the other. You roll in all directions, union jack style, I leave any rolling in the line of play until I am rolling my first pitch for play and actually prefer to roll on the diagonals. 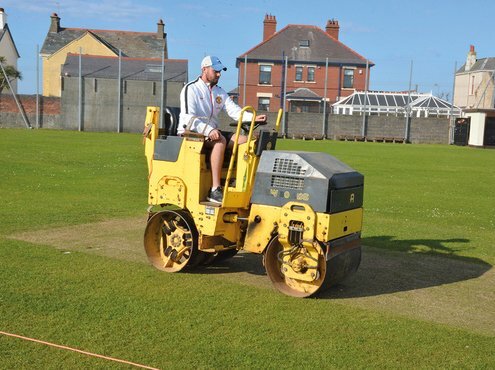 Many groundsmen still talk about how many hours they roll for; that's fine, but how many pitches do they have on their square? It's bound to take longer to roll a twenty pitch square than say a ten. Today, we talk in passes; up and down the same line counts as two passes using a twin drum roller. Science again informs us that, carried out in the right conditions, 20 to 22 passes is sufficient. 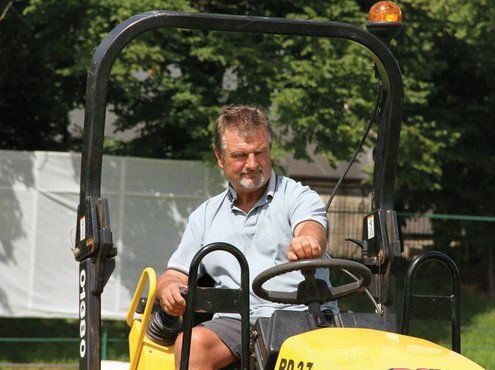 Take a ten pitch square with ten foot wide pitches using a four foot wide roller; it will take three runs to cover a pitch with the overlaps. With the best will in the world, it will be extremely difficult to get the exact speed correct. So for ease of maths, let's assume each pass takes one and half minutes and, that it takes ten minutes to cover a pitch. So, it should take approx 100 minutes to roll your square. If you only have a three feet wide roller, it will take four runs to cover a pitch, so it will take three minutes longer per pitch. In this case, it will take approximately 12 to 13 minutes per pitch, making a total of say 120 minutes. So, a ten pitch square using a four foot wide roller and doing twenty passes will take approx 100 minutes per pitch, three and one third hours and sixteen and two third hours to roll the square. Job done; nowhere near the eighty to one hundred hours that we used to hear about. A rolling programme is very important, but it is not the be all and end all in achieving the required soil bulk density; a drying profile is. 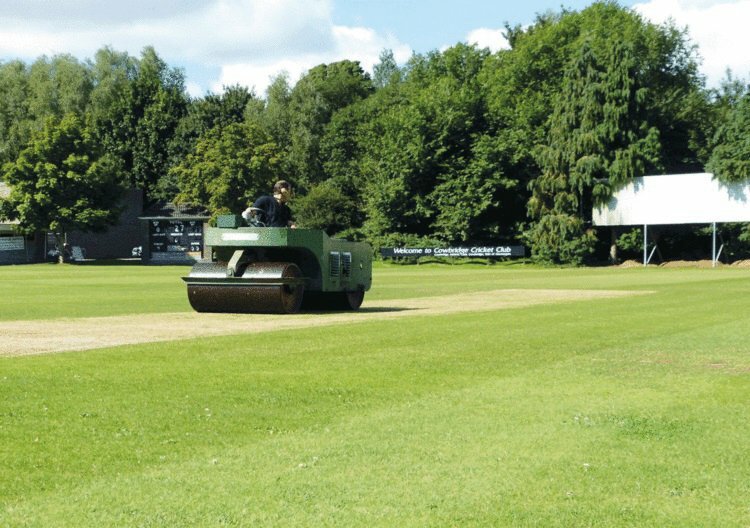 When carrying out the pre-season rolling, don't just roll every day because you can (unless the temperature is 20°C plus). Leave two or three days in between each operation, allowing the profile to dry, so that there are some pore spaces to close down. Remember, if the profile is too wet the roller cannot push down on the soil - it will only sink into the profile and push the soil forward. This will often create a break within the profile which will, in turn, absorb the force of the ball instead of rebounding it, and is often the cause of slower, lower pitches. So, despite having good intentions we can easily do more harm than good. The perfect soil profile needs to be a lot drier than the average person thinks, but too dry and there will not be enough moisture to stick the pore spaces together. Remember this; to achieve the best, there is no hurry. You will only achieve the optimum for your ground, as the ground conditions become right, whether that be in March or April or even May. The fact that the fixture secretary or the league has arranged your first match is not going to change the weather. If a game has to be played in less than ideal conditions, use your mower as the roller, it will be plenty heavy enough. A very apt saying is this, LESS IS OFTEN MORE. Happy rolling!